Last Sunday I visited Fountains Abbey in North Yorkshire with my parents, a day out to celebrate both my birthday and their 45th wedding anniversary. It’s a wonderful place to visit for several different reasons. The ruins of the Cistercian abbey, destroyed with the dissolution of the monasteries under the orders of King Henry VIII, are fascinating for anyone interested in history, whilst the grounds within which they’re set contain both a medieval deer park and a Georgian water garden. It’s a beautiful place to walk around. There are so many different things to look at that it’s practically impossible to see it all in a single visit. We began our day by walking around the deer park. We saw a few deer, though most were too far away to photograph. Within the area there is also a cottage, a church, an obelisk, a 400 year old sweet chestnut tree and lots of gorgeous views. As I’m sure you all know by now, I love taking photographs of paths and random countryside scenes – there were lots of these for me to enjoy snapping. I especially loved all the autumnal colours. The paths led us around to the lake, where we paused for a time at the lakeside tea rooms, and then on to the water gardens. All around the water gardens are lots of little follies. … until finally we reached the abbey itself. After we’d enjoyed a tasty Sunday dinner in the Abbey restaurant and explored the ruins we walked out past Fountains Hall, where a wedding party was gathered for photographs (which unfortunately meant I couldn’t get a clear shot of the hall). It was nearing time for us to leave by this point so we caught our last few sights before heading back to the car. I hope you’ve all enjoyed my virtual tour. 🙂 If you’d like to know more about the history of this wonderful place, my mum, Millie Thom, has also written a post, looking at its changing role over the centuries. You can find it here. Now I need to return to my NaNoWriMo prep – this post took me far longer to put together than I’d intended! Thank you, Shivangi. 🙂 We had a lovely day – though we’d have liked to stay a while longer than we did! Gorgeous photos, thanks for sharing! I especially like the ones of the woods and paths, perhaps because I already saw your mother’s shots of the ruins (although yours were great too). Such a lovely day for your tour, too! 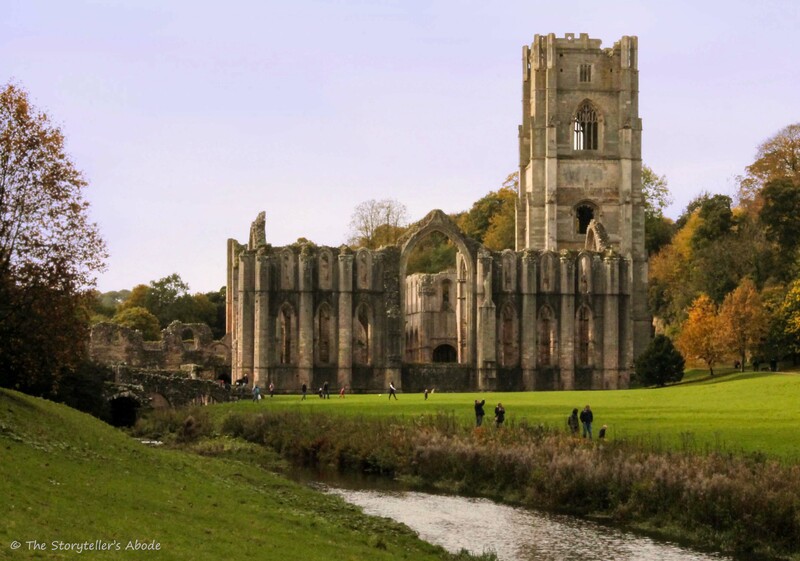 Always wanted to visit Fountains Abbey. Sure looks stunning in your photos! It’s one of my favourite places in Yorkshire, both for the abbey and the deer park – I was lucky enough to visit one year during rutting season. We watched the deer battle each other for hours, and the noise they made was so unearthly, almost like whale song. Mesmerising. Thanks for sharing, made me want to back soon! I just read your mother’s wonderful history and now this!! Wow gorgeous pictures!!!! Thanks, Lynn. 🙂 I’d usually include a few more historical facts myself but I knew Mum was putting together her post so I thought I’d just stick with the photographs. I’m glad you like them. They are amazing! thanks for sharing! Thanks, Ali. I’m glad you like them. 🙂 We were very fortunate with the weather. It stayed gorgeous all day. Thanks, Jacqueline. 🙂 It’s a beautiful place. All of the images are beautiful and the castle reminded me of a modern fairytale. I particularly loved the semicircle arches 😍. All the best in Nanowrimo. What beautiful countryside. I would love to visit there one day!! This looks so cool! I’d love to walk around there and explore! Amazing photos! Almost fantasy-like. You and your mum sure have the ‘eye’ for a beautiful photo op! I’d have my wedding there too. Super Duper Beautiful! WOW! You live in a gorgeous country. Simply marvelous pictures. Thank you, Frank. 🙂 It’s great to see you back on the blog. Sorry for the delay in replying – I’m taking part in NaNoWriMo this year so I’ve been busy writing my novel! Thank you for sharing!! It is such a beautiful place!! Hope you had a wonderful birthday too! Beautiful photos, Louise. That looks like a gorgeous place to spend a day. Thank you. 🙂 It’s a lovely place to visit.